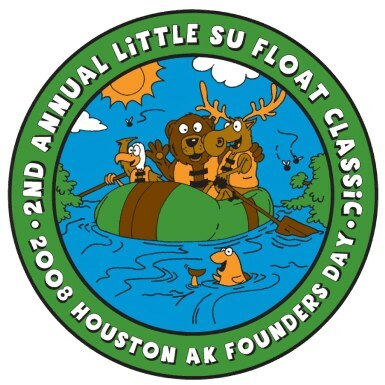 The First Annual Little Su Float Classic will be run on August 16th 2008. Racers can register Monday-Friday 10-2 at Capital Choice Mortgage in Wasilla, Lucas and Parks.7/18/08 till 8/15/08. Forms available at Visitor Center, Millers Market, Houston Lodge. Registration can also be done on the day of the race. Kayaks will leave first, canoes second, rafts and other floating craft third. Prizes will be given for the first 3 places in the 3 classes. Personal floatation devices must be worn by all. Minors must be accompanied by parent or responsible adult. 1. PFD’s worn by all. 2. Kids accompanied by adults only. 5. No bumping into other boats. 6. Extra paddles are suggested. 7. Bring your cell phone if you have one. Register your number with race marshall for extra safety. 8. No parking at the Little Su Park. A Shuttle will be provided to racers who need a ride from the Founders Day Parking at the Miller’s Gravel Pit. Please let us know if you need a ride after dropping off your boat. Security at the Park (for your boat)and the Gravel Pit (for your car)will be provided. 9. Have Fun…..this will be a great day and a new yearly tradition for our families.